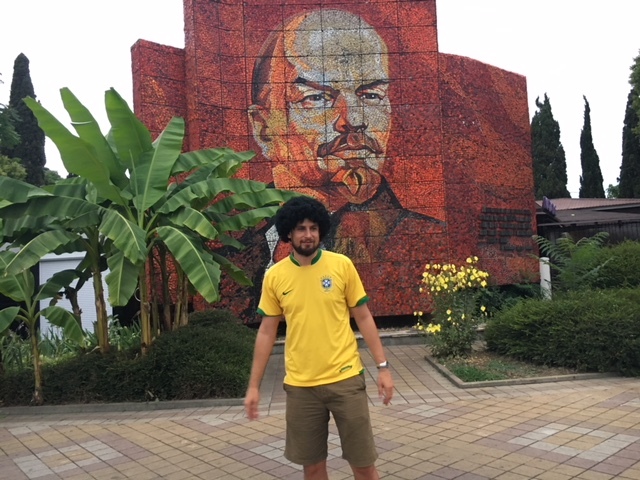 Brazilfooty’s tour of Russia continues. Where else can you meet so many characters in such a short space of time? We are in Sochi now and Brazil may have misfired a bit in their opening match against Switzerland, but they deserved to win. Okay – they didn’t press hard enough for the second goal when on top and Alisson should have done better with the goal. But, Miranda was fouled for Switzerland’s goal and Brazil should have been given a penalty. They also had about five shots cleared off the line. I wouldn’t worry too much about this result. I still have faith. I wrote most of this post on Sunday sitting in a trendy café called Café Terrace del Mar, overlooking the Black Sea while sipping a beer and listening to house music. 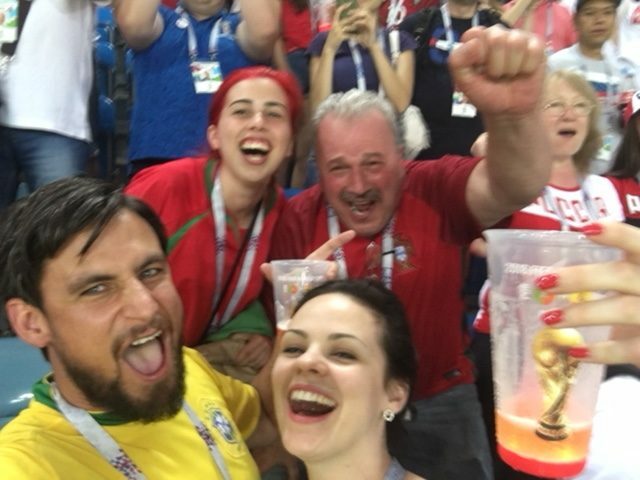 Since the previous post, we’ve celebrated a birthday in Moscow, been and done St Petersburg and partied the night away in Sochi after watching the Cristiano Ronaldo show at the Fischt Olympic Stadium. We’ve also mingled with Panamanians and Belgians ahead of tomorrow night’s game and met some amazing characters along the way. This video, taken at 6am after saying we would go out or one drink, is a good way to sum it up. But there is a lot more to this trip than the parties so lets scroll back a few days. It was Tuesday morning and I was feeling a bit run down. So after drinking Champagne with caviar for breakfast I caught up with a few hours of extra sleep. People in Russia don’t always drink champagne and eat caviar for breakfast but it was Tatjana’s Auntie’s birthday so we had a good reason to celebrate and indulge. After my afternoon nap we went out for some more delicious Georgian food before having a few more drinks, saying our goodbyes and setting off for St Petersburg on the sleeper train. 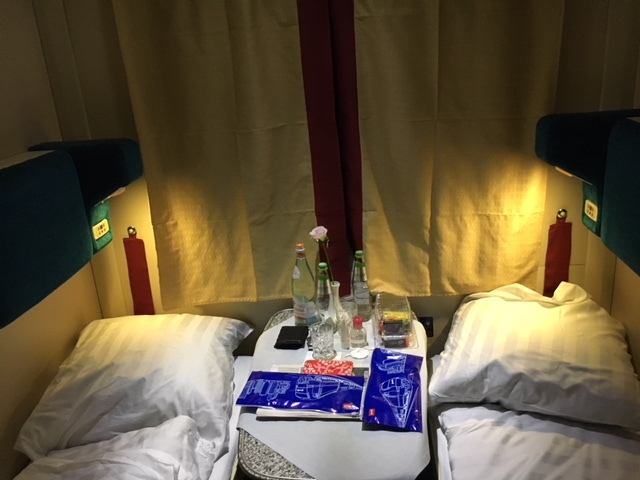 This was my first time sleeping on a train and our cabin looked exactly like I imaged, which was based on my vague recollection of such things in Bond movies. There was no villain busting into the room in the middle in the middle of the night, but the service was Bond-esque and classy: polite and well dressed staff offering a three course meal for breakfast, served at your time of your choosing. We opted for fruits, soup and beef stroganoff. An unusual combination, but was exactly what I needed to help me keep my cold at bay. After dropping our bags at the hotel on arrival in St Petersburg we headed to a trendy coffee shop come restaurant called Mickey & Monkeys to meet Tatjana’s friends Sofia and Aris. I regret not doing it but I turned down the chance to have the biggest ever milkshake I have ever seen. 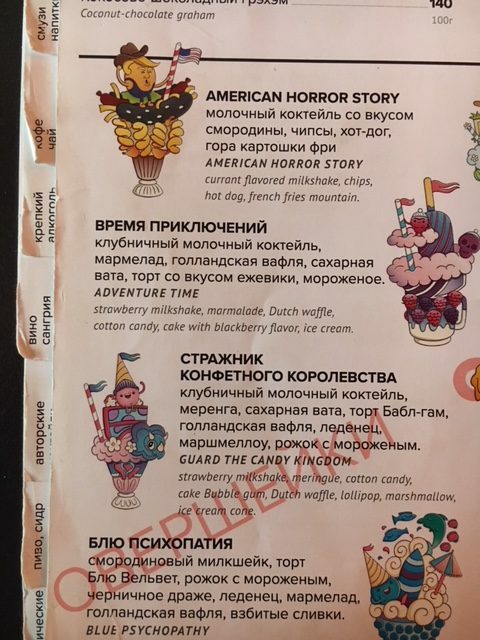 So many choices with my personal favourite being the American Horror Story, served with Donald Trump on top of a hotdog in a milkshake. 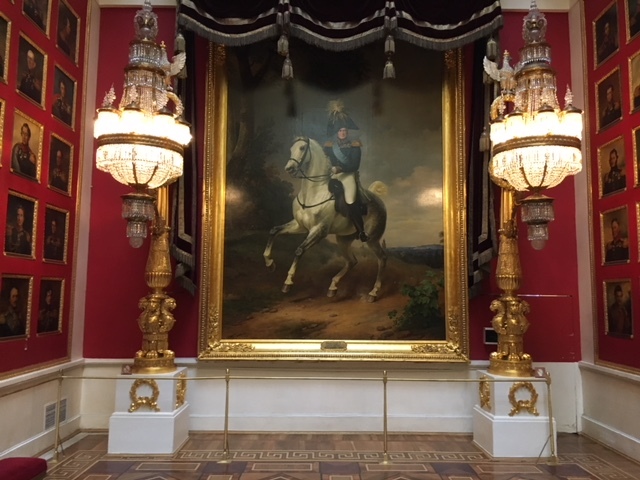 We only had two days in St Petersburg but we managed to cram in the two main attractions: the Hermitage Museum and Peterhof. The latter very impressive and the former stunning. Our first night in St Petersburg was another late one. We started out having street food and drinks at a neat joint owned by Roman Abramovich with Dima and Alisa, two friends of Tatjana’s and St Petersburg locals. 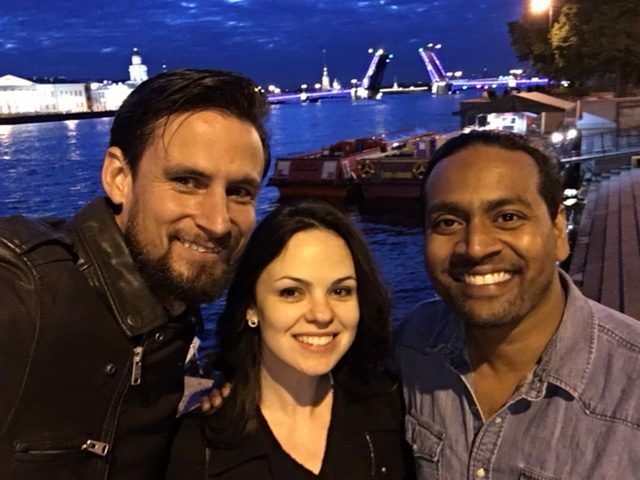 Not only were they really friendly and really good hosts, but they also showed us some trendy local spots and took us to see the opening of the St Petersburg bridges at 01:10am – a daily procedure accompanied by loud classical music and some nifty lights. 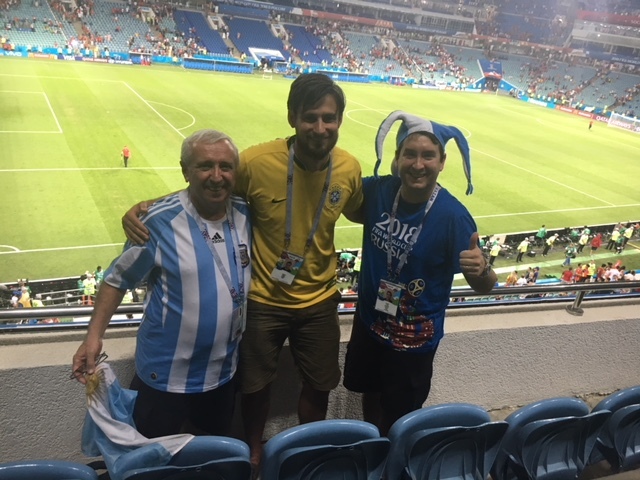 We were joined by Iresh, who I met at the World Cup in Brazil four years ago. Lets just say he is a friend who likes to party. As for the football, we went to the Cristiano Ronaldo show three nights ago. Spain 3 Portugal 3. What a game. What an atmosphere and what goals. What a player. You have probably watched the game or read about it, so no match report is necessary on here. But Brazilian football enthusiasts will be interested to know that there were many Brazilians in the crowd with their Seleção shirts and club shirts too – Cruzeiro, Palmeiras, Coritiba, Atletico Mineiro and Corinthians to name a few. Like them, I was supporting our Portuguese-speaking cousins, although I was most interested in seeing a good game and boy did we get one. How about this. CR7! 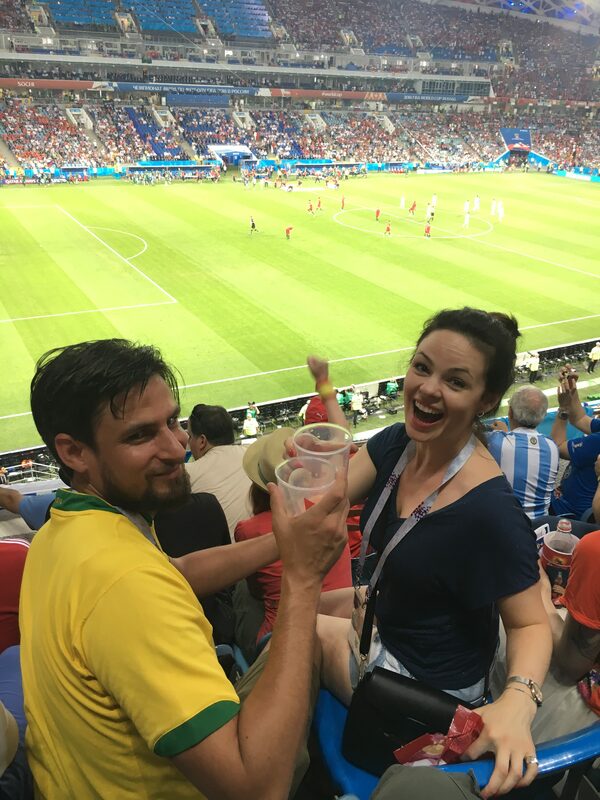 I also enjoyed beers, explaining how football works to Tatjana, teasing Argentina fans and generally having a good time. As for Russia, we watched the thrash Saudi Arabia in El Gasico at an Irish pub in St Petersburg with our good hosts Dima and Alisa. 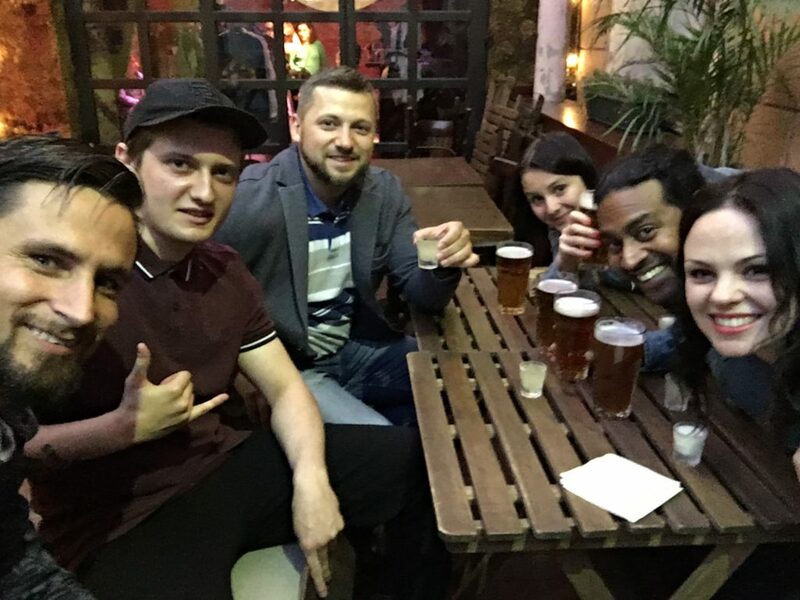 We were also joined by Iresh and Svetlana, who had just passed a law exam, so some shots were in order for that and the five goals. What surprised me most though was how subdued the city was. Admittedly, we were in an Irish bar so Russians may have chosen other places to watch the game but the streets in Russia’s second biggest city were fairly quiet after the game. Most of the noise was coming from the Iran and Morocco fans who were playing in the city the next day. I know expectations are low in Russia and Saudi Arabia are pretty rubbish, but if South Africa had won a football World Cup match 5-0, people in the second largest city of the country would be going absolutely crazy. Perhaps expectations are so low that nobody cares, despite the 5-0 win. Another theory that I have is that despite their reputation as party animals, most Russians are actually quite reserved and quite shy people, and not generally used to public displays of rowdiness. Not all Russians, of course. And it also depends how much they’ve had to drink, although you do get some characters who are stone cold sober. One of those was Genia, a butch but polite guy who sat next to us on the plane from St Petersburg to Sochi. I was in no mood to talk and he didn’t speak any English, which suited me just fine, but not long after we had taken off he struck up a conversation with Tatjana, who was sitting in between us. I was desperately trying to push some zzzs with almost no success and before long I was in the conversation with Tatjana doing the translating. He was a very charming young businessman from Siberia, with a genuine smile, who also used to be a boxing coach and turned out to be a big fan of Stalin. I only learned the latter after I was leaving the plane and I was adding him on Instagram (he asked very politely). This was when he very proudly showed me a photo of an old guy with an impressive moustache, which was both his Instagram profile picture and his phone screen cover photo. He seemed disappointed that I didn’t know who it was. Now, I don’t know much about Stalin other than that he was the leader of the Soviet Union during World War II and that under his leadership they successfully defeated the Nazis outside Moscow. I also know that he ruled with an iron fist and killed hundreds of thousands of Russians in the process. So why did Genia like Stalin, I asked? His answer was short and sweet: he won the war. I wasn’t sure what to make of this. Is that a good enough reason to like someone, despite all of the other things he did? Does liking Stalin make Genia a bad guy? Can you be a good person and like someone who deliberately killed millions of your fellow countrymen? My head tells me no, but I still feel like Genia is really just a big cuddly teddybear deep down inside. Does he know what Stalin did? Do I know what Stalin did? Faced with this moral conundrum, I later told Dima (from Moscow) about my new friend and asked what he thought. Dima simply said: “I like this guy” and laughed out loud, like he always does. Another character was our taxi driver Georgi Kinkladze. I think he knew we running late for the match, but I don’t think he needed much encouragement to speed along the winding road from Sochi to the Fisht Stadium in Adler to get there on time. He happily used the hard shoulder when the traffic got heavy and he was very composed while driving and posing for this selfie. I’m not sure if his name really is Georgi Kinkladze, but we are very close to Georgia here in Sochi and for some reason this guy felt like a Georgi Kinkladze to me. Dressed in his sports clothes, driving his right side drive car with cracked windscreen and USB cables draped over the dashboard. What a guy. My favourite moment was when he crossed a dual carriageway in front of oncoming traffic, cutting in front of a car coming in the other direction while talking on his phone and beeping his appreciation to the cars for ‘letting’ him through. We got to the game on time. What a champ. 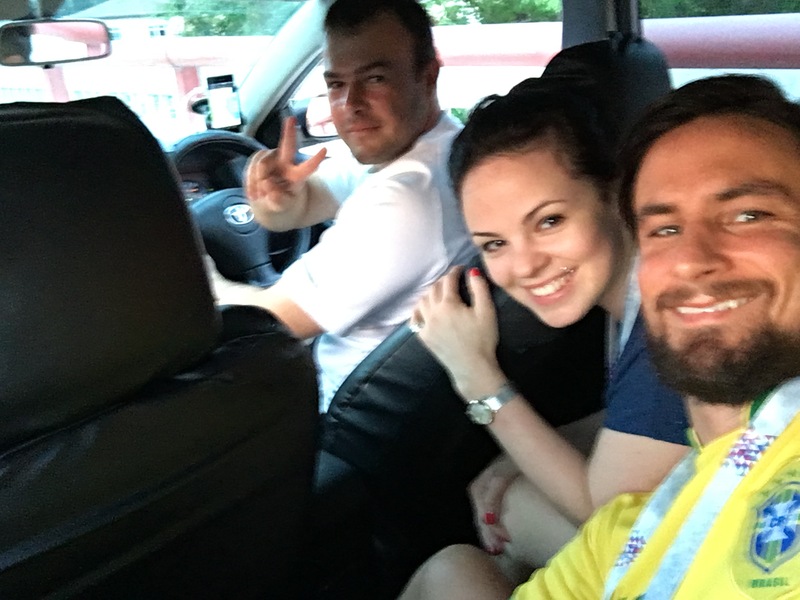 We only got back to our hotel in Central Sochi at around 1.30am on Saturday morning. Logistical issues and lack of a good wifi connection meant we lost Iresh so we decided to meet him for a quick beer, even though we were tired, at a place called Mr Jager. Dima had just arrived from Moscow so we thought it would be good to introduce him to Iresh (brothers from another mother). 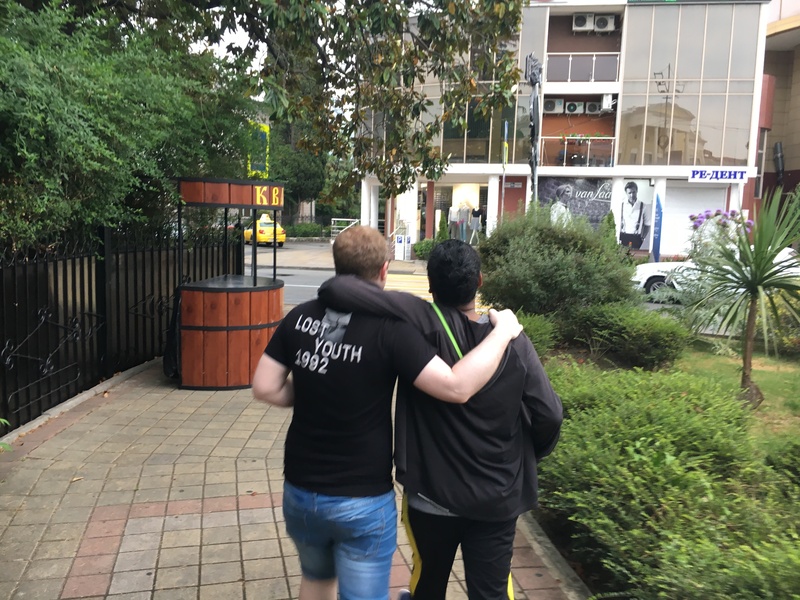 We should have known that ‘just one drink’ was never really going to happen in a place with a name like that and that picture above was Iresh and Dima walking home at 07.30am. Admittedly, one of the reasons for breaking our very vague ‘only one drink’ intention was that everyone seemed to love me in that club, especially the men, which I know seems slightly odd. 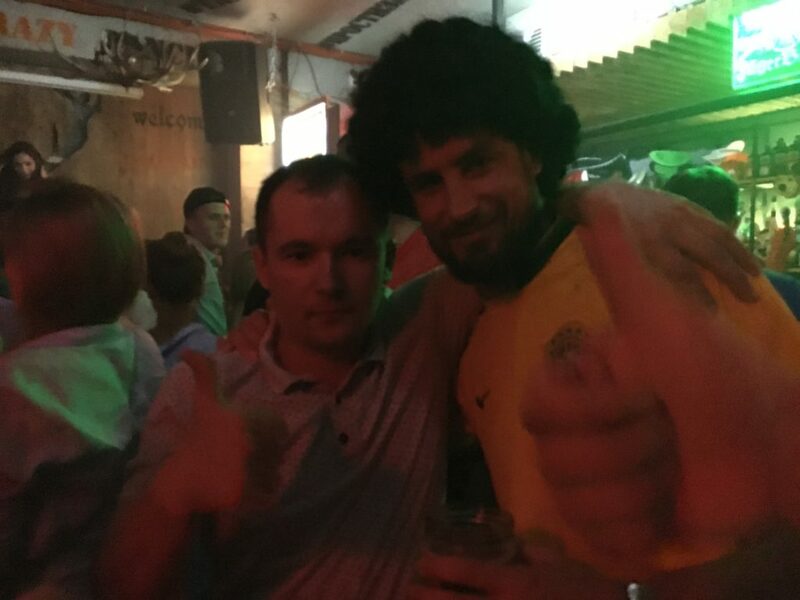 Perhaps it was the Brazil jersey, or the afro wig. Strangers would insist on buying me a shot, although some were disappointed when they discovered that my wig wasn’t my real hair. Others couldn’t comprehend that I am South African, live in London and write a blog about Brazilian football. One of my biggest fans was Andrei, who was about 6’4″ and who told me that he loves me without any hint of irony or sarcasm in his voice. He repeatedly hugged me and thanked me (for meeting him and talking to him, I guess) with possibly the biggest grin I’ve ever seen on a man. He later showed me some pictures of a tough looking guy with tattoos on Instagram who turned out to be his brother, who was in jail, and who he really wanted me to meet. Another guy couldn’t comprehend that I was from Africa yet proceeded to tell me how much he loved Africa before squeezing me tightly (see video above). The final man to express his admiration for me that night was a camp sounding chap who stopped me in the street on my way home to tell me how much he loves Brazil and Brazilian dancing. A person’s sexual orientation is an issue for some people in Russia, but perhaps it isn’t quite as homophobic as people make out. In between all of this attention we went for a swim in the Black Sea where we met some drunk guys on the beach. Most of them were cool, but one of them was not such a fan. He seemed to be looking for trouble and wanted to pick a fight with me for beating him in a swimming race, even though I was about twice his size. Not wanting any trouble, we decided to make a hasty exit. A rather big bloke called Vitaly restrained the smaller idiot from following us, so the smaller idiot proceeded to start a fight with Vitaly. We could see them grappling and could hear more commotion as we walked away but fortunately some police were on hand to break up the trouble. I know how to defend myself and I’m 6’2″, but I wouldn’t want any trouble, especially not in Russia. The next night, though, we were sitting in the park, minding our own business although laughing quite loudly when some large guy with one of his hands bandaged up came charging out of the bushes and heading our way before a woman (presumably his girlfriend or wife) interjected and turned him around when he was about ten meters away from us. He grumbled repeatedly but it was about ten minutes before he finally left the park. Clearly he was drunk and angry for some reason. But why? And why charge towards us? I didn’t think it was a good idea to go over and ask him so I’ll never know. 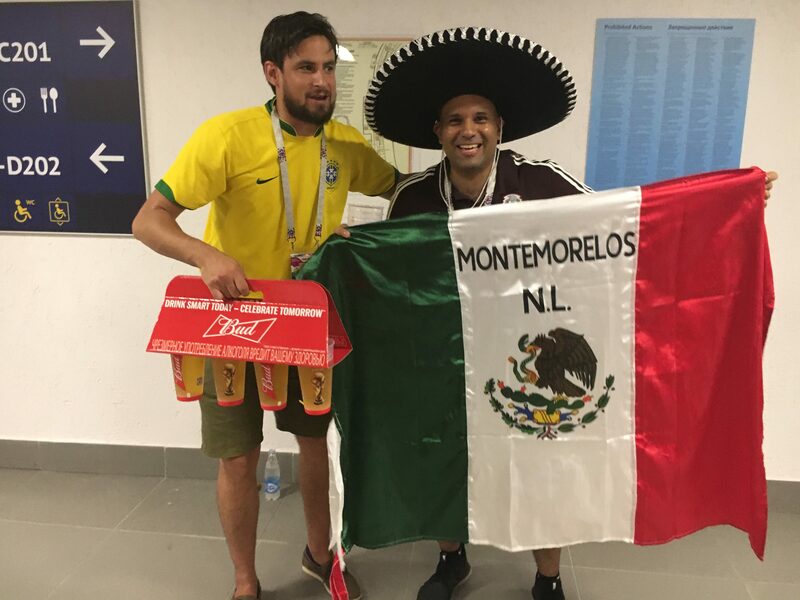 Meanwhile, Mexico have beaten Germany and this is what happened in Sochi last night as Belgium and Panama get ready for their encounter later today. Brazilfooty will be there. 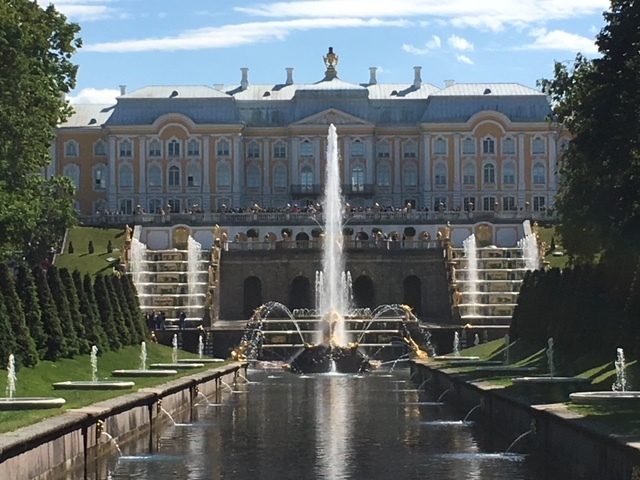 Our trip is sadly coming to an end soon, but there will be time for a few more adventures in Russia in our last few days I’m sure. If you like this post, sharing it with friends or on social media would be much greatly appreciated. That sort of thing really helps small bloggers like myself. Thanks for reading it until the end and I’ve provided you with a little bit of flavour of the World Cup in Russia. This entry was posted in 2018 World Cup, Brazilian football, Seleção, Special report and tagged Belgium, Cristiano Ronaldo, Panama, Portugal, Russia, Sochi, Spain by Brian Davidson. Bookmark the permalink.